Zunächst ließ sich alles ganz einfach an. Ich installierte das neue Plugin, nachdem ich die kostenlose Light-Version deaktiviert hatte. Die testweise angelegten Galerien konnte ich auch mit der Pro-Version ansprechen. Gut, ich löschte die Galerien und begann “from scratch”. I followed Your steps for debugging but missed to check envira gallery and the addons for envira gallery. I expected they were prooved by envira team before releasing it to envira users. I was wrong to do so. The Envira Gallery – Defaults Addon caused the problem. I would really be pleased if You keep me informed when this Addon is fixed. I would need to use it because my Website will have to provide more than 1.000 pictures – and to klick to each album to change default values would be a little bit too time-consuming. 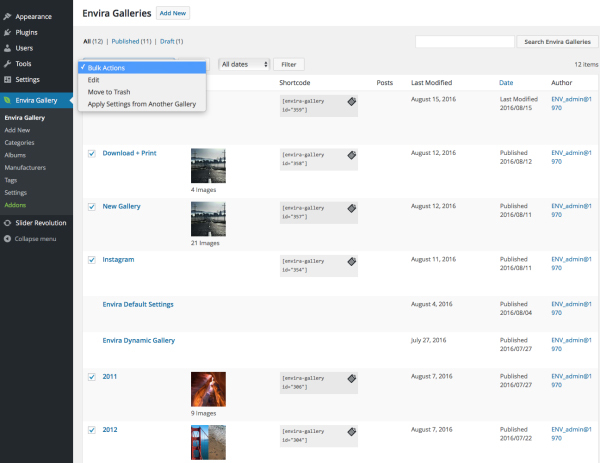 Can You tell me if there is an effort to make default-plugin working with envira gallery? I have to generate more than 200 galleries. And you might understand that I don’t want do give them new defaults one by one. Another, new, problem: diyplaing pictures on a mobile device like iPhone generates real micro-pictures – even if I disable lightbox on mobile (which I shouldn’t do with my theme anyway because of missing theme lightbox support). Is there a solution?